I often get asked: What is the best Citizen made movement? It is a good question but there is no straight forward answer for that. What does it really mean “the best movement”? Is it the most complicated, the most decorated, the most precise? Hard to say because for each of us it could mean a different thing altogether. Let me start by saying that when this question is asked, these three watches are the ones I think about. They are not chronographs but all are precise and regulated to high standards. 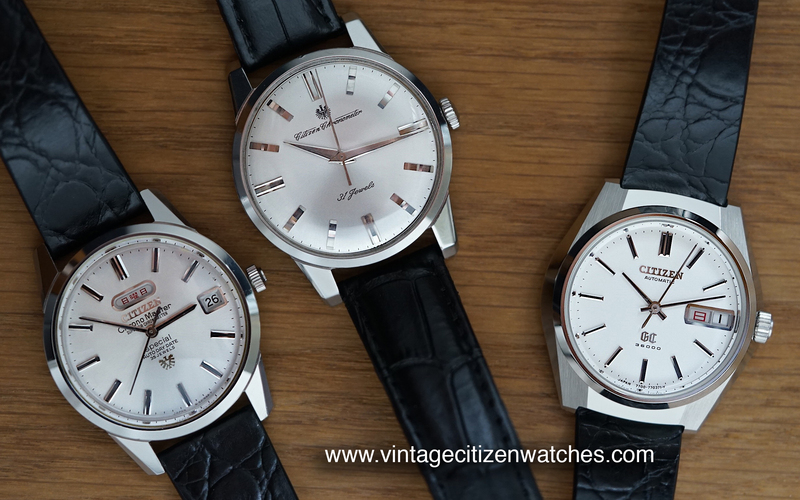 They have beautiful movements and at the time they were made they competed with Grand Seiko and their Swiss counterparts and most of the time Citizen winning the game. Thank you for watching me, here is a good news for you! 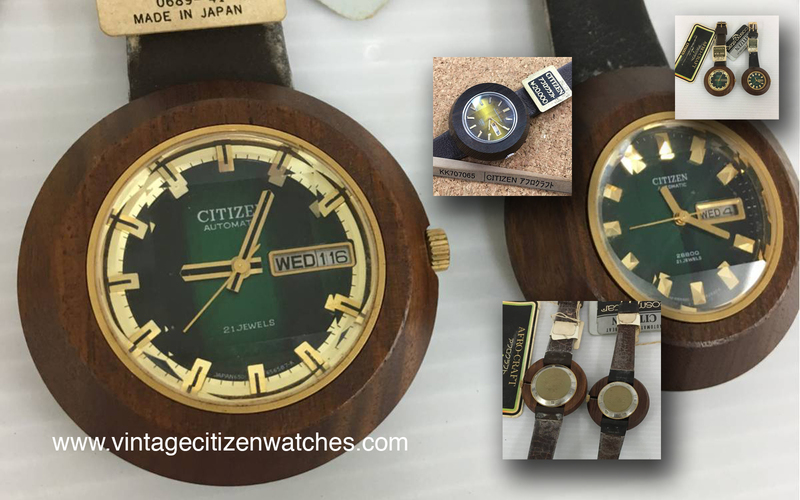 Just a heads up: I am selling 10-15 AWESOME Vintage Citizen Watches from my collection. And when I say “awesome” I mean it. NOS divers, chronos, Chronomasters, you name it! Solid gold and SS, ultra rare, simple and complicated, and… I know they are not cheap, but some of the watches I will list will be once in a lifetime opportunity to get. No, I am not selling my entire collection, just a part of it because I needs some funds for a new project. Study first, have the money ready (as much as you can get) and be fast, really fast! Imight have special gifts to come with some of the watches, I might refuse to sell a certain watch to some people, I might ask for special conditions when I sell these. These are some of my most loved watches that took me years and years to find so I am not letting them go to make a few bucks. Most of them are NOS, mint, with original straps, original buckles, some with box and papers, price tags and other tags… The prices and condition of sale will change with time, some prices will go up, some maybe will go lower. Write me a comment here, write me on Instagram citizen.guy , on Facebook: Citizen Guy or on e-mail citizen.guy@mail.com and we can talk about your dream watch. I need to give them a good, loving new home. So… If you wanna have them, approach me as a collector not as a dealer. You will not regret, they are perfect, ultra rare and maybe once in a life time opportunity to get such a watch.By the way, I am not selling my entire collection, just a part of it, because I need some funds for a different project, hence the reason why I am letting these beauties go. So… this is your chance, don’t waste it! Also… here is a pic with all there is available now, in the picture below. You can click on it to magnify. Tropical – This should be the first undisputed one. When you hear the term “Tropical” just turn around and run as fast as you can. Most of the time “Tropical” means a badly deteriorated dial, maybe baked in the oven, tampered with to the point of becoming garbage. Since the dial is (probably) the most important part of a watch, you just don’t want anything labeled “tropical”. “Spider dials” and other similar terms included. Leave these watches for the old pirates who know their stuff. Never polished – Oh, yes! Never polished means most of the time that the watch was badly abused and is full of dents and scratches. Who knows what’s inside?! Better to leave it be. Walk away from “Never polished”. At the same time, walk away from “Polished”. You just need an honest watch. Rare and Ultra mega rare, Unique – Well… maybe it is rare but that doesn’t actually makes it valuable. Let the rare watches for the ones in the know. Keep it simple, keep it common, keep is safe. Collectable – Everything is collectable. So any watch is like this and “collectable” means nothing else than that the seller is trying to make an extra buck for this watch you are interested in. Is it advertised as “collectable”? Yes, it is, and so are all the other watches. Don’t let people tell you what is collectable for you or not. Project watch for restoration – This is a NO GO! This means that if you get it you will go mad or even die before restoring it. This is not easy and you will never make this project watch what you were made to believe you will. Project watches are not for you. Go away. Spend your time and money elsewhere. Mint and NOS – Mint watches and NOS pieces should be never opened, never serviced, no dings, no scratches and perfect in every way. Yes, this is the way to get them if you are lucky. Aim for them but don’t overpay for such a piece because once you start wearing it, the watch will no longer be NOS and Mint. Box and papers – Though is nice to have your vintage watch with box and papers this is not a must. Most of them don’t. Back in the days people didn’t care about the box and the bought the watch for wearing as they are supposed to be used, not for collecting dust in a bank safe for investing purpose as nowadays. So… box and papers, cool but not mandatory. Good investment – Really?! If it is such a good (once in a lifetime opportunity) investment, then why the seller does’t keep it himself? Watches can be good investment when you know, after a lot of years of learning the hard way and in the end… it all comes up to luck. Don’t be fooled with the “investment” value of any watch. Buy and wear what you like. Water proof – Just forget about even showering with your vintage diving watch unless you service it and water test it at a trusted watchmaker. Jus’t don’t! Homage watch, inspired by… – Do NOT buy fake watches! Ever! End of story. Bottom line: If you have experienced friends, ask for help. Ask for help but decide for yourself. What do you like, when are you gonna wear the watch, what is your budged? Learn about the model you are looking for as much as you can. Do your homework and buy the seller rather than the watch. Yes, I know it is not easy and it seems overwhelming but we all had to start somewhere and we all learn day by day. You will find so much joy and beauty here, friends, you will make cherished memories… enjoy the Vintage Watch World! Have fun doing it and do’t take it so seriously. And one more thing…. 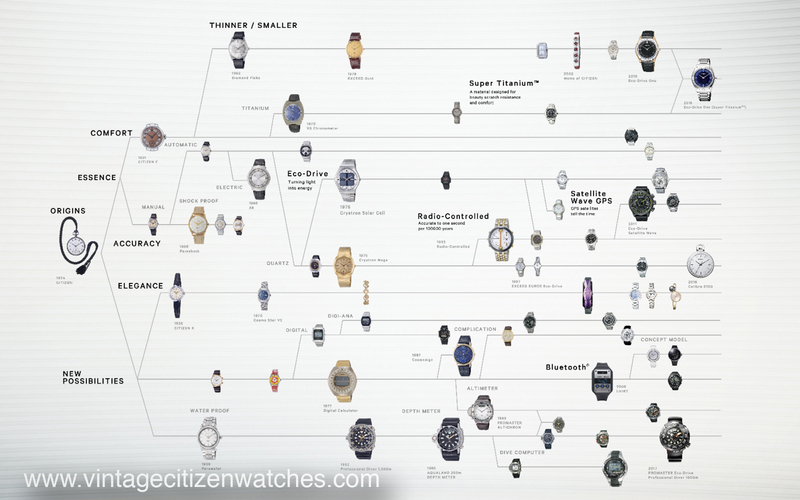 never forget… the Grail, the Perfect watch, the “exit” watch is not real. We have so many details that we love when we look at our watches. Some of them are in the dial, some of them hidden underneath the case back and others are nothing more than these small round parts that we use to interact with them, the famous and indispensable winding crowns. Citizen made a huge variety of watch models, had a lot of watch lines and of course… so many crowns, in different colors, materials, shapes, sizes, engraved or not. 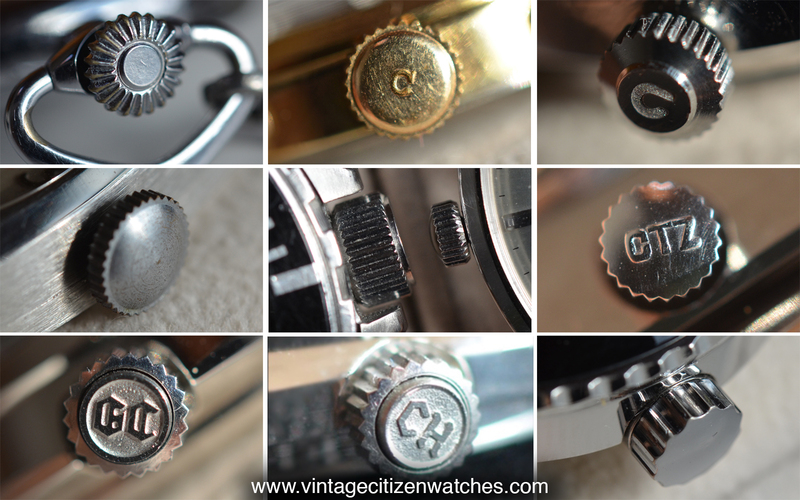 In this article I will write about ten interesting facts about Vintage Citizen Watches crowns. Not all the times the crown material matches the watch case material. The non – branded ones were first, then came the “C” and the last ones were “CTZ”. These types overlap. We will never know all the facts about them. Unless you know exactly the model, you have a NOS one, or some catalogue pictures… unfortunately you can never be sure what crown that specific watch is supposed to have. This search and documentation is also the curse and the blessing when collection vintage watches, and Vintage Citizen Watches. 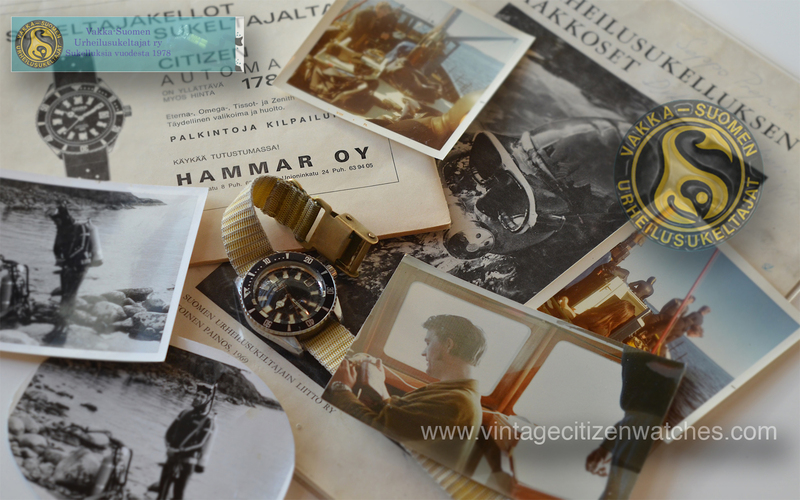 Enjoy the journey and share your findings (as a comment here or on the Vintage Citizen Watches Facebook Group so others can learn and grow too! Maybe this is the most useless “do it yourself” article ever. Why? Because there are only two more guys I know about that have a Citizen Chronomaster 500m. (Hello Howard and Jose! 🙂 ) There are only 15 watches I found online in all my years of being borderline obsessed with them. I have two and the exact one in this article is available for sale at this very moment. Anyway, let’s dive right into it! Let’s pretend you have the watch (congratulation if you do!) and without going to the watchmaker, because you get bored on your Christmas / New Year vacation, you decide you have nothing else better to do than spending your time removing the movement of the most rare and expensive Vintage Citizen Watch ever. First thing you have to do is have the watch in your hand, remove the strap / bracelet /nato… and look for the right instruments. A watchmaker knife, some tweezers and a small screw driver, a suction cup and a loupe would be great. As you already know this is a unibody case, so the case back doesn’t come of. This is to further ensure the 500m, eliminating a weak link (the case back). Use the knife to (carefully) force the bezel out. Just stick it under it (I use a small cotton fabric to wrap around the blade so I can protect the watch from scratches) and put a little force using the lug as a lever. It will pop right out. 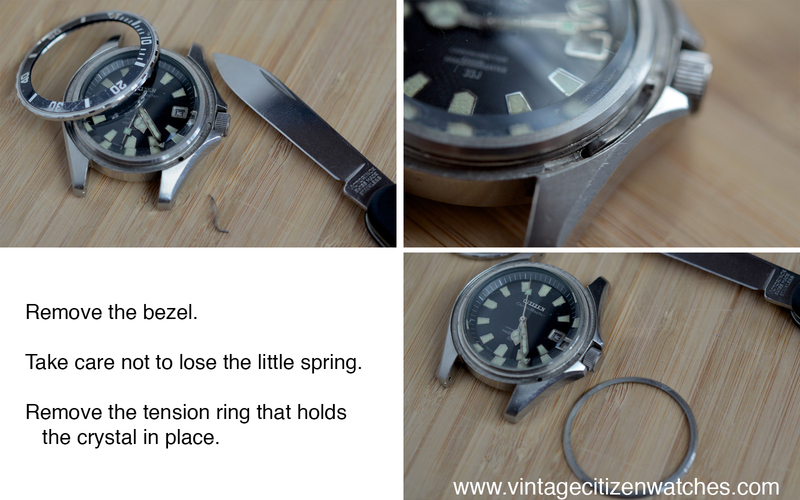 Be careful not to lose the small metal spring that is located in a small space and inserted in a hole at 4 o clock under the bezel. It is there so that we can have the unidirectional 60 clicks action of the diving bezel. Then remove the tension ring that holds the crystal, using the same knife. No fabric this time because there is no space. Take your time, it is not difficult at all. Because you already have the suction cup, just use it to lift the crystal. Something sticky will do the same thing. 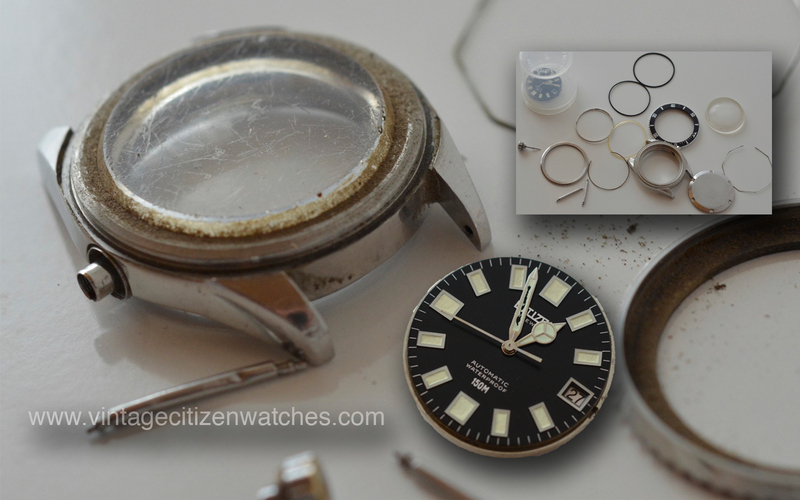 Now use the magnifier and the tweezers or / and the small screwdriver to remove the dial bezel ring and the rubber seal that is under the crystal. Good! 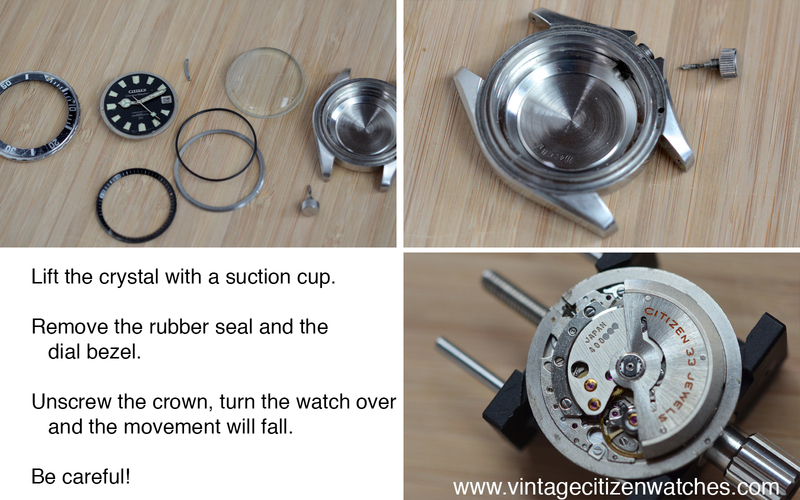 Now unscrew the crown, turn the watch face down and rotate the crown…. the movement will fall! Be careful on what it falls onto and do not touch the dial or bend the hands. If you want to make sure this doesn’t happen you should remove the hands before turning the watch dial side down. (that is for a different article). Now, put it back together! LOL! Read more about this awesome watch HERE. 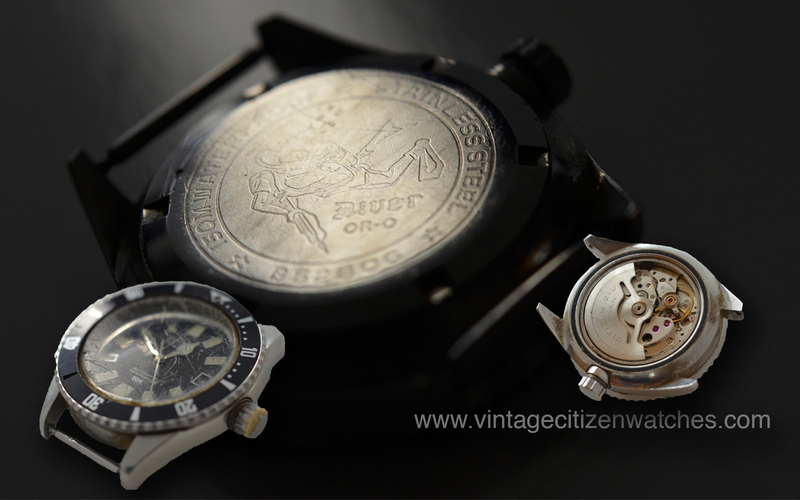 Everybody knows Citizen was the first worldwide to use Titanium for their watches. They also used Aluminum alloy, Solid gold (white and yellow), Stainless steel, “harder than steel” black coating and they didn’t stop there. 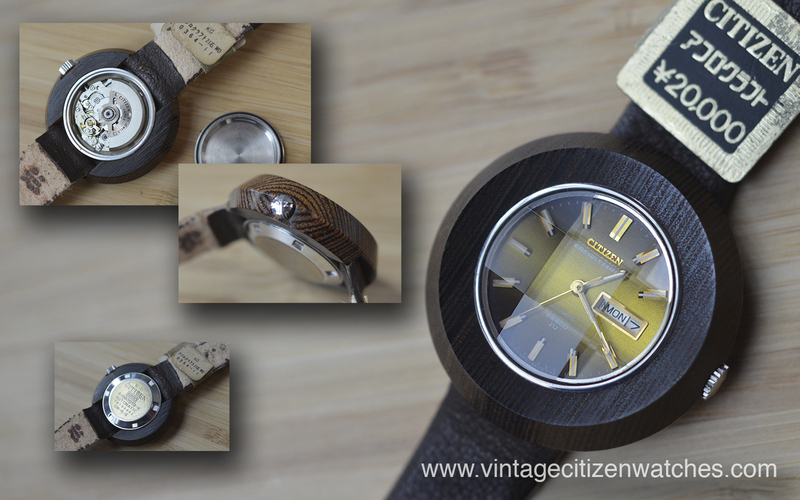 With a little bit of luck we can still find watches made of natural materials. In the process of finding new ways, in providing more diversity, Citizen made watch cases made of natural wood and a few types of stone. These watches were intended for the younger customers that cared a lot about fashion and the way the watches looked like and were also interested in having a watch with a story. As you can see they were branded under Adorex line, or Afro Craft, Cosmo Star, V2… Usually a leather strap was used but I have found a few with a bracelet option. Other materials might have been used for straps but I am not sure. Still to find out. The movements are diverse, simple or displaying the day / date and some are high beat. The cases are rounded and the crystal sometimes is faceted (see the wood variant below). Colorful, young, eye catching and interesting at the same time. Thank you Branislav for the beautiful red agate stone picture! Beautiful watch! I have in my collection a NOS wood case one, original strap, buckle and tags. The build quality is very good and I love the warm feeling of the material. I never had a stone watch but for sure I will find one. Somehow a wood / stone Citizen is a must have for at least once in order to fully appreciate the craftsmanship involved in these. The picture above is my watch, so I opened it to take a look at the movement. Beautiful, clean and interesting. Citizen is having its 100th anniversary this year and we all know what a major event this is, a once in a lifetime opportunity to take a look at the past century of fine watchmaking and still have a glimpse at the next one. I couldn’t have missed it for the world! 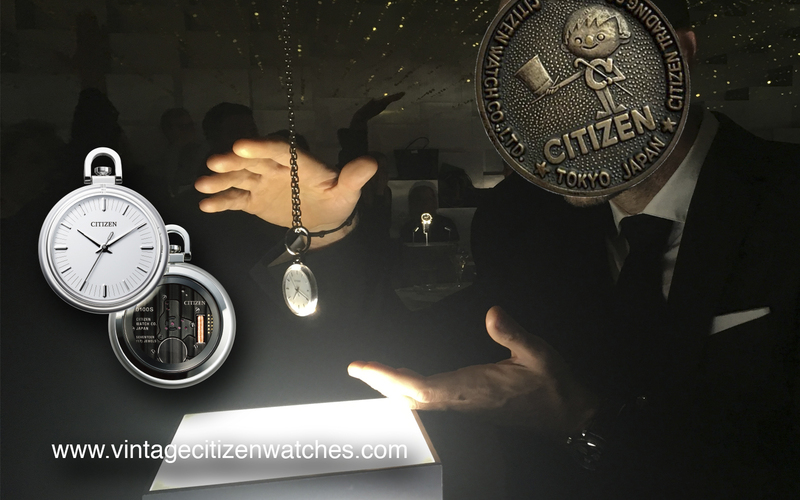 Our trip to Baselworld trip story started a few months ago when visiting the Citizen Headquarters in Tokyo Japan. Our host Wakaba Kuroshima said she was looking forward to see us in Basel. Without even blinking I agreed: that would be lovely! So… fast forward to a few weeks ago when she sent us invitations for the Citizen 100th anniversary party. Thank you Wakaba! We were already accredited as press, to cover the event, but the official Citizen nominal invitations made me so proud to be there that nothing else really mattered those days. We booked a few hotels, cleared our schedule and fueled the car. Road trip to Basel! 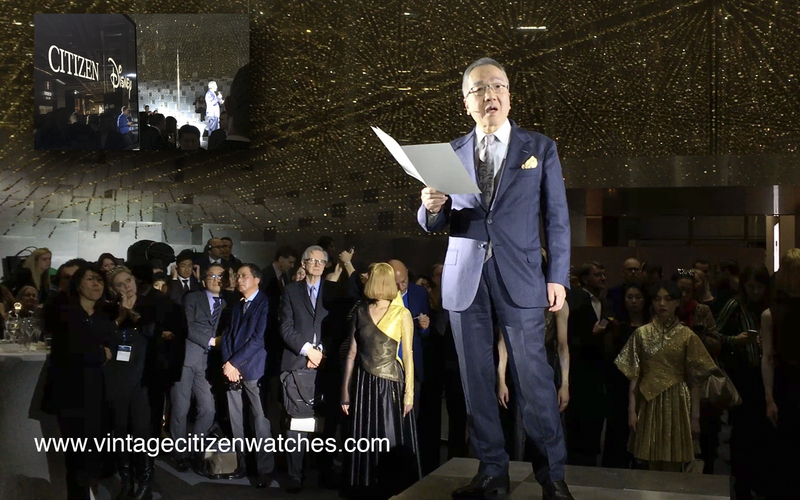 By the way, this is the first time I went to this well known world watch event and, I know it is hard to imagine, I only did it because of the Citizen party. The trip was long but awesome! 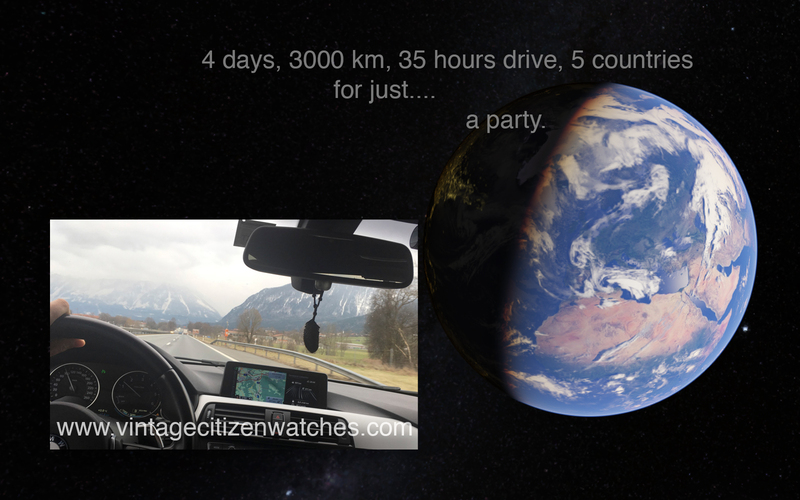 Five countries, 3000 km, 35 hours driving time, a few restaurants along the way and all this for just a two hours party?! Well, that is correct, it was not just a party, it was the Citizens 100th anniversary and there was not a chance I would have missed it. Sunny and snow, cold and rain, stuck in traffic on the highway and yet again doing 250km/h plus on German Autobahn… We made it in Switzerland just in time to meet a few on-line friends at the fair while taking a look at the new watch releases. Unfortunately, because of the tight schedule, I couldn’t meet all the friend I planned to. Hopefully next time. From prehistoric times until now, countless civilizations and tribal nations have asked this very question. The gears of time have been turning ever since humanity first became conscious of the concept, and it is no doubt that we will continue to contemplate time inthe future. Born alongside time, we have it to thank for human emotions: joy, sorrow, and at times, even suffering. It has created our history and engraved our memories. Entering the 20th century, however, time was presented with an additional element: speed. Thanks to a revolution in technology, time accelerated – or at least this was the illusion we were under. Before we knew it, humanity had begun to consume time until it had lost its very soul. And now, time has become digital, smart, and taken on a most cold and mechanical nature. 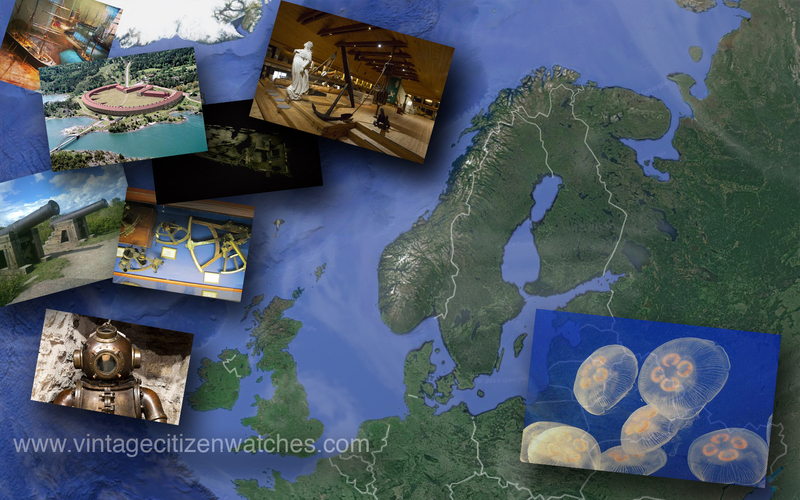 Consequently, CITIZEN has decided to focus on “What time means to the 21st century”. The question that we have been posed with now – as citizens of the 21st century – is “What is time for?” The answer will depend on our meaning of happiness. 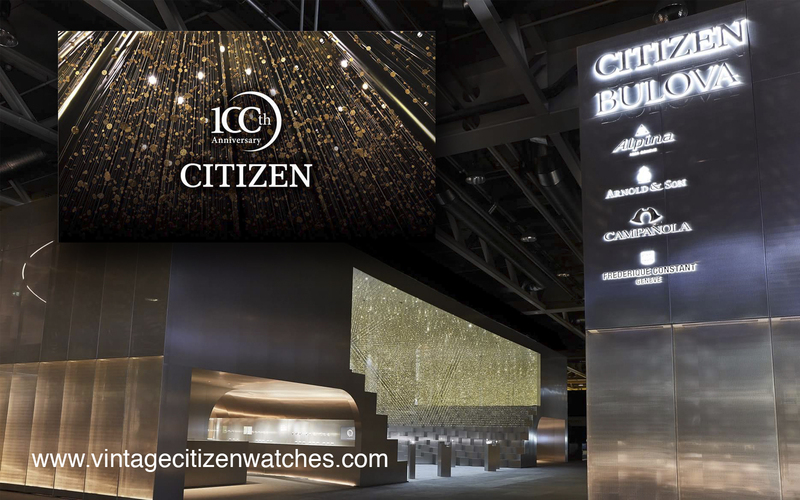 At the CITIZEN Watch Group booth at Basel world 2018, we will be paying homage to this elusive concept under the theme, “We Celebrate Time.” As we approach our 100th year anniversary, the CITIZEN Group as a whole will be holding a special watch exhibition and performance at what we have named Time Theatre. It will also feature the dazzling installation that “turns” light into time, LIGHT is TIME. We will be surrounding our visitors in 21st century-light through an installation of wrist watch main plates meticulously positioned to form a spectacular geometrical space. Bulova will also be holding an exhibition reflecting on time, “History of First” is a visual representation of the brand through the time span of its 143 year history. Join us in our homage to time in the 21st century, as We Celebrate Time for the sake of the future. 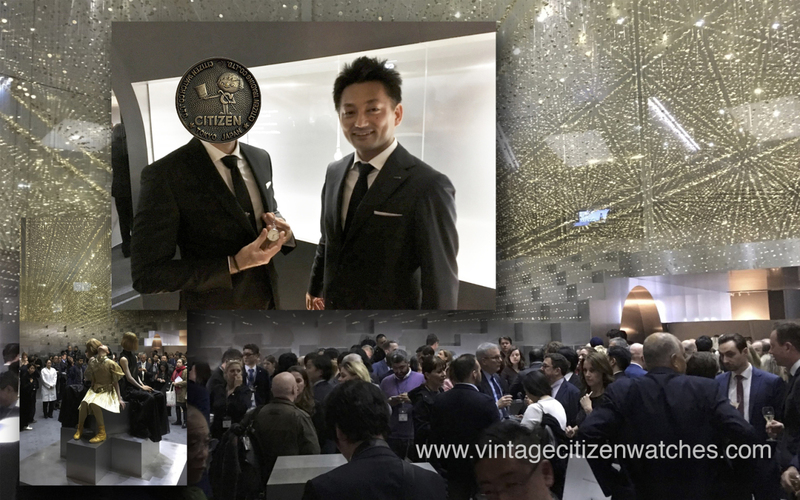 Back at the party I was so pleased to meet Wakaba again and I had the opportunity to meet for the first time in real life my friend Hiroyuki Ohta, manager at Citizen Watch Co., who gave me a lot of support in the last years. Thank you my friend! Hope to see you soon and keep in touch! The Citizen Watch Group encompasses six unique brands: CITIZEN, Bulova, Arnold & Son, Frederique Constant, Alpina and CAMPANOLA-each proclaiming its individual achievements in innovative style and technology, which they have cultivated throughout their respective histories. By celebrating time, which includes understanding and acknowledging the time each brand has invested to reach this moment, we believe together as a group, we are better equipped to pioneer the next great advancements in the world of watches. 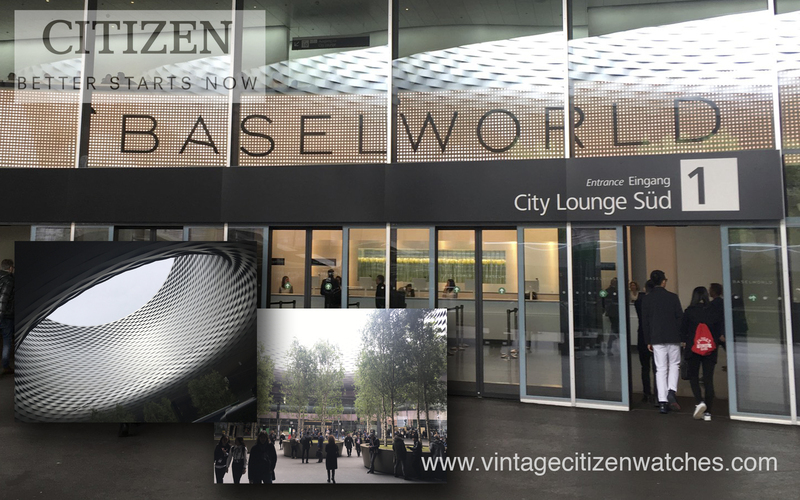 This year at Baselworld 2018, Citizen Watch Group is pleased to introduce the new Time Theatre, created under this year’s corporate theme, “We Celebrate Time.” The Time Theatre is open to the public and is a place where we hope people can gather and honor the special moments in their lives, from the past to present, as well as gaze into the future and the many amazing experiences that have yet to be realized. The Time Theatre also showcases the latest watches by Citizen Watch Group brands for those who share a common passion for distinguished design and craftsmanship in watchmaking. In 2018, CITIZEN is celebrating its 100th anniversary, and throughout our existence we have continually sought to define the meaning of “time.” Whether it’s an accumulation of seconds, minutes and hours, all accounted for on our wristwatches-or perhaps the very stream of our lives, “time,” it can be interpreted simply as a series of momentary events that occur. 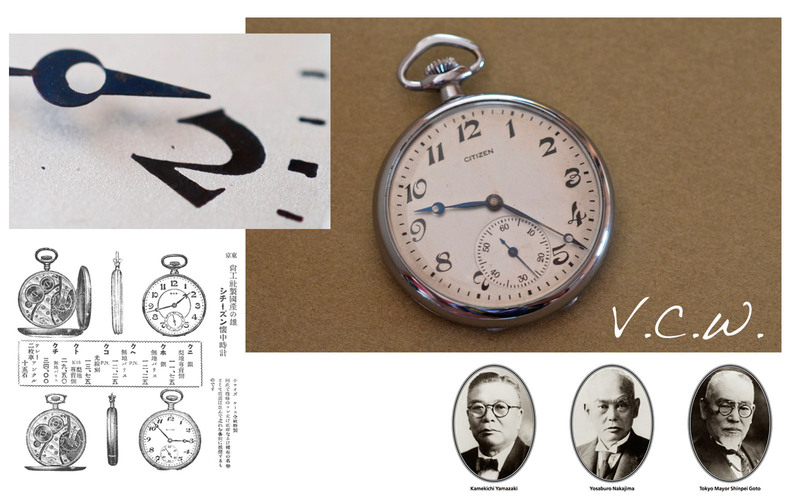 Time truly is precious, so the tools to measure and communicate time must be accurate, and CITIZEN’s unwavering mission and pursuit for accuracy has continued since its founding in 1918. We are also proud this year to announce the “Cal.0100,” the world’s first light-powered Eco-Drive movement to deliver an accuracy within ± 1 second a year. The Cal.0100 is completely self-sustainable, relying only on a light source and the mechanics of its internal movement to deliver precise timekeeping, autonomously and continuously. The technology allows us a more efficient and honest appraisal of time, and with it, the ability to better manage time and enjoy the precious moments of our life. Please join us as “We Celebrate Time” at CITIZEN’s Time Theatre, where we will be displaying a number of innovative new products by CITIZEN, Bulova and other Group brands. We thank you for your continued patronage and support, as we set forth into the next 100 years at Citizen Watch Group, and continue our pursuit of excellence while pushing the possibilities of watchmaking design and technology. During his speech Mr. Toshio Tokura also announced the Citizen – Disney collaboration and this is a major thing. They became the official timepiece of Walt Disney World Resort, Disneyland and Marvel new media’s creative space. Among other things, the Walt Disney World Resort and the Disneyland Resort will begin offering Citizen timepieces featuring designs unique to Disney Parks. Citizen will also become a red-carpet sponsor for the highly anticipated Marvel Studios’ Avengers: Infinity War film in April 2018, creating experiences surrounding the release of this milestone movie. So many good news and for sure the future is looking bright for Citizen and Eco Drive but somehow I feel a little bit disappointed in not having a mechanical watch as a 100th anniversary. 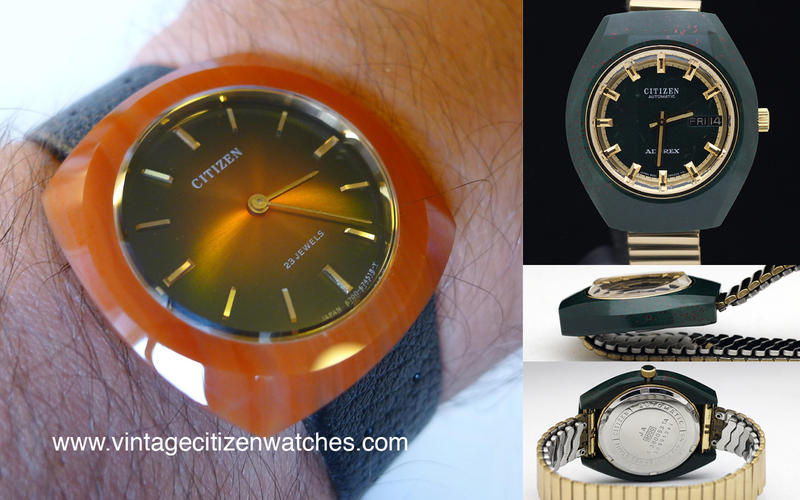 Well.. every watch brand is doing an homage and at least a few vintage inspired modern reinterpretations, and they sell like crazy, but Citizen was not. Why? I know why but still, the hope is the one that dies last. The answer is deep in the Citizen philosophy: Small-ER, Fast-ER, Thinn-ER. 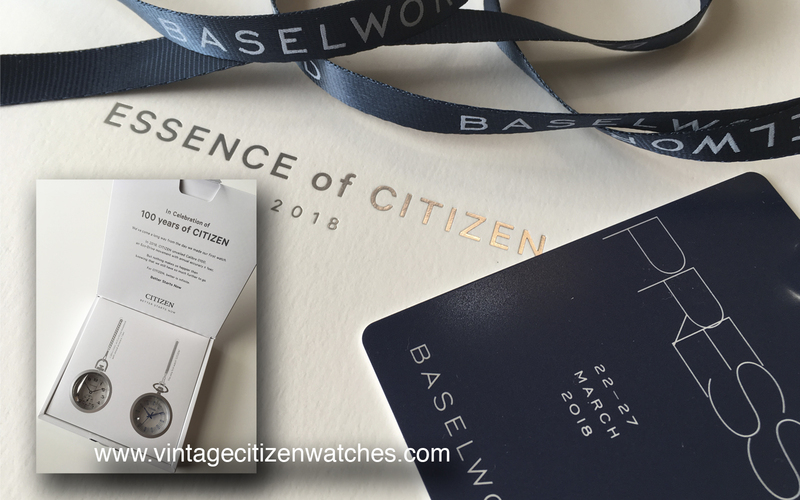 As a gift, when leaving the party we got the Essence of Citizen 2018 catalogue and two beautifully presented lollipops shaped and the first Citizen and the newest one. Amezaiku – is a traditional Japanese candy craft art. Thank you Citizen! Domo arigato! The new 100 years will be better and better, that is for sure! They were always improving and innovating so they will not stop. 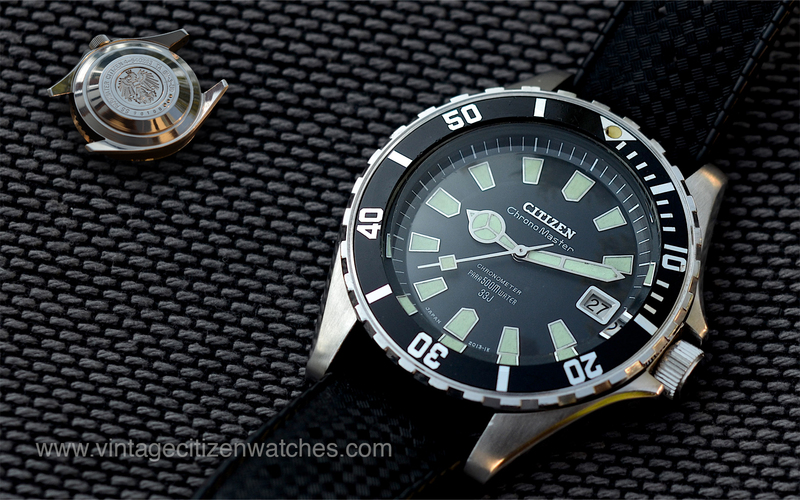 CITIZEN has pursued the essence and further possibilities of the watch ever since the company’s founding. There is one challenge that we have actively confronted throughout that entire time: superior precision. We debuted our first quartz watch accurate to ± 10 seconds per month in 1973, and in 1975, we debuted Crystron Mega, the world’s first quartz watch accurate to ± 3 seconds per year. We continued to produce even more accurate watches with longer running times incorporating our proprietary light-powered technology Eco-Drive. Calibre 0100 tells the precise time autonomously based on an internal mechanism with no reliance on time signals from radio towers or GPS satellites. It marks the individual seconds in their purest and most refined form. Like a strong person who achieves his goals through sheer force of will, it uses its own rhythm to tell the precise time for everyone, wherever they are, without depending on anything outside itself. The Calibre 0100 marks the start of the next one hundred years of watchmaking for CITIZEN. Read more about this calibre and the future plans of Citizen HERE. Thank you Citizen! I am so proud and humble at the same time to be a part of this wonderful story that keeps on going! 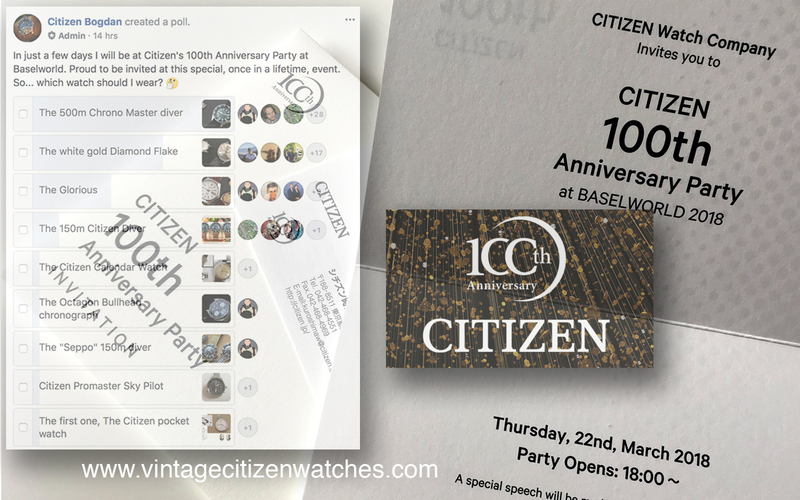 In just a few days I will be at Citizen’s 100th Anniversary Party at Baselworld. Proud to be invited at this special, once in a lifetime, event. So… which watch should I wear? I have to take so many aspects into consideration when making this decision: first of all, it should be an important watch in Citizen’s history, a rare one, a cool conversation piece, one of my best… Also, I have to think about the way I dress, about the over 12 hours drive to Basel, the weather maybe? Hm…. Tough choice! 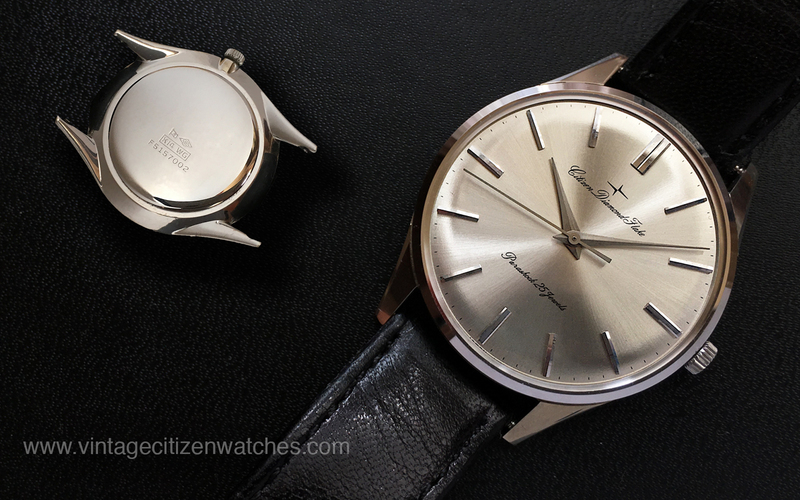 The 1971 Glorious is one of the rarest and most appreciated Vintage Citizen Watches. It is not called “Glorious” for nothing. At the time of its launch it had one of the most precise and accurate movements in the world, and many say it was a lot better than the direct competitor: the best of Grand Seiko line. Awesome 36,000 bph movement, no doubt about it, perfect SS case finishing, NOS, a pride to have in such condition. Does it get any better? I would love to have it with me at Baselworld! The 1962 DF is so much more than a beautiful watch. It was, at the time of its first appearance, the thinnest three hands watch movement in the entire world, at only 2,75mm! This is the ultimate dress watch: thin, elegant, no date, no lume, manual wind movement, silver dial and…. let’s not forget that my example is made of solid white gold! Talk about class! What better choice for a formal Citizen party? This in my Holly Grail, one of my pride and joy watches, the 1969 beast diver! The best of the best! Would I strap this on my wrist, hell yeah! Is it a good watch to wear with a suit? Maybe it is not, but look at it, read about it and wear it! I wrote a lot about this awesome watch and no more words are needed, this is the “to go to” watch at any Citizen get together. But is it the best option for this occasion? My Facebook friends think so and this is still to be decided in the next day. 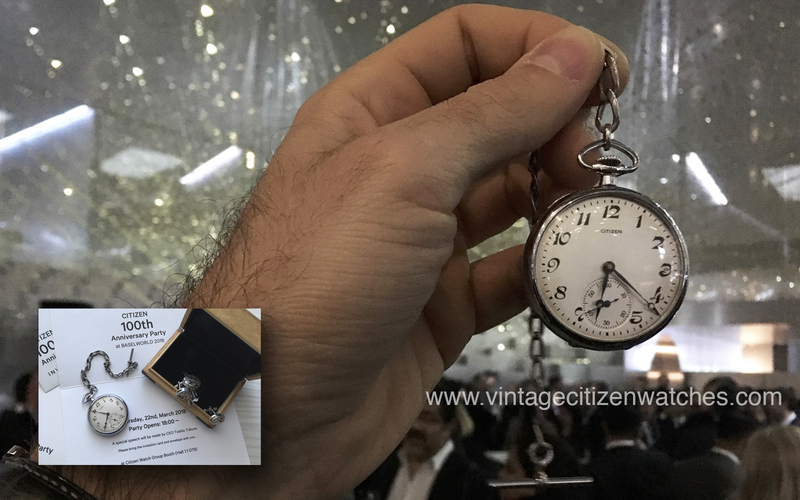 Somehow this simple pocket watch went under the radar but think about it, after all it is the 100th Citizen anniversary and the watch that started it all, the first, the one to be celebrated here is in fact this one, the one and only, THE CITIZEN. So why not more votes for this one? I would vote for it and in fact I will right now and give it a chance! The battle is on and one of these will go the 2018 Baselworld for the 100th year anniversary party. So… which one should it be? I had a dream – a dream about watches, adventures and open waters. I had a dream about freedom, and friendship, about trust, duty and honor. It was the late ‘60s – a time of change. We had the moon landing, not because it was easy, but because it was hard. We had the Beatles and Bob Dylan. We experienced Woodstock, raced cars with naturally aspirated roaring engines, smelled the burning rubber and the exhaust gas. We watched Paul Newman films, surfed under the So Cal sun or enjoyed a glass of vino rosso somewhere on a hill in Tuscany. I had a dream about the time when a watch was so much more than jewelry, when its purpose was to indicate time and it was used in the way it was always meant to be: racing, diving, flying or timing important events, even in space or on the Moon. Yes, I’m talking about tool watches! In the picture above is me, diving, and Seppo wearing a shirt with the logo he designed. In the background we can see the watch. It was the late ‘60s and the world was experiencing major changes. Somewhere in Mariehamn (read about this place HERE), Seppo Prepula was also about to have a change in his life. He found himself in sudden need of a new watch. As he was walking home from work on a cold day, he noticed heavy rain clouds forming overhead. He picked up the pace but it was already too late. The notorious Finnish weather caught up with him, setting in motion the events of our story. He got home soaking wet, down to his Omega watch. He was not happy. Two years ago he’d started taking diving classes at the local fire department in Hanko. He’d been bitten by the diving bug and decided that the obvious, natural thing to do was buy a diving watch. His old watch was now ruined, which only motivated him to follow this path and make no compromises in his choice. He’d heard about a Japanese company called Citizen, that offered high quality diving watches. 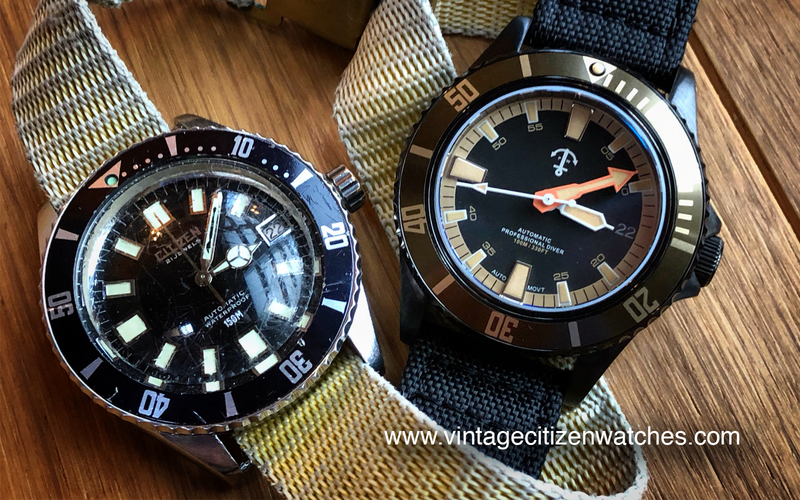 So he entered a store in downtown Mariehamn, had a brief talk with the seller – who proceeded to throw the disaffected Omega in the trash – and decided on a new Citizen diving watch, the 150m B52806. That very watch is on my wrist as I write this article. Here is the watch, the way I received it, caseback and movement too, before cleaning. Before sending me the watch, Seppo described it “practically new”, and he was so right! The beauty behind this statement is amazing. Even though time took its toll on the crystal, even though the lume is yellow and some of it is gone, even though the case is showing so many deep memories and the crown no longer screws back in… Seppo is seeing it through the same lens he did the first time he laid eyes on it. What Seppo sees when he looks at the watch is his reliable diving buddy. Yes, Seppo, I can confirm… the watch is indeed “practically new”. Thank you so much for allowing me to wear it with pride, to keep it and enjoy it as you did. Now back to Seppo and his story. 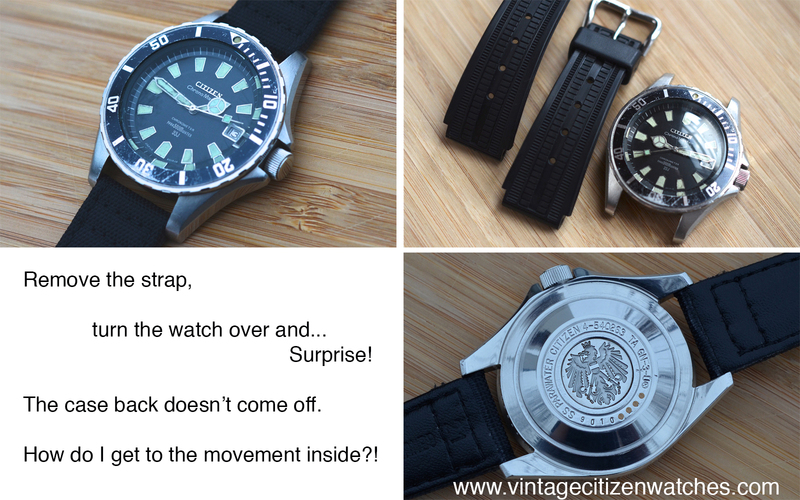 A few weeks ago, his son, Conny, wrote a comment on my site www.vintagecitizenwatches.com telling me that his father has an old diving watch and inquiring about its value. Well… the rest is history and here I am wearing it today as I tell its story. Between the years 1960 and 1990 Seppo did a lot of diving. Today he is 76 years old and his son Conny is 46 (younger than the watch). In fact, it seems highly probable for this watch to have been at his father’s wrist when Conny was born. Seppo wore it almost all the time, rain or no rain, and, of course, when he was diving. That was, after all, its main purpose. And he dove all around the north European seas. All his life revolved around this passion. He used to wear his special knife, looking – as Conny recalls – just like a Jedi master. Some personal pictures of Seppo, diving and wearing the watch, the club logo and the watch on the strap he used for diving. This is how I received it. He started diving in 1967 in Hanko, near Mariehamn before he moved to Uusikaupunki where, with the support of his diving buddies, he founded a diving club. That happened in 1978, the year I was born. He also designed the club’s logo, which is still in use today. Visit the website HERE. He remembers one of his first dives in 1968 at the Plussa wreck, where he uncovered a sextant and a helm. These artefacts are now proudly displayed at the Mariehamn Maritime Museum. Read more about it HERE. In Bomarsund, he dug up cannons and a lot of brass/copper ammo core as well as plenty of old cannon powder, stored in tubes (“I enjoyed these in the late ‘80s and almost lost my eyebrows a couple of times because of that, says Conny”) Read about it HERE. Ten kilometers north of Bomarsund, in the early Swedish times, dives were organized to mine for silver and rock crystals in the remnants of the old mine. The watch reportedly reached a maximum depth of 70 meters (WOW!) in front of Eckerö Post & Tullhus of Åland. Eckerö’s post operated in the time of autonomy as Russia’s westernmost border station for Sweden over a hundred years, which is what made it such an interesting place for diving. The wreckage remains hidden somewhere in the deep waters and will one day for sure be discovered. Read more about Aland HERE. At Herrö, many dives were made to the wreck of Skiftet. They were sludge cleaning the wreck and lifting up items from it. In one of those dives, Seppo’s regulator got stuck somewhere in the engine room and he had to take his tube and gears off at a depth of 25 meters. “Small close call issue”. Read more about it HERE. A lot of grenades and ammunition were saved in the seas in front of Hanko – read about it HERE. Read more about the old Mannerheim coffee house HERE. In the late ‘70s, Seppo was part of a group of divers searching for bombs off the Hango coast. Seppo dived, located grenades and marked them for explosion. They were old Soviet grenades left there after Soviet occupation in WW2. Seppo and his family also lived in the region for a couple of years. In the early ‘80s at Uusikaupunki, a 300 kg anchor was raised up in front of Lyökki. It now belongs to the Uusikaupunki Museum. “I remember that trip when I was a young boy, my father was with a 6-member diving team that made this job at a depth of 40m”, Conny recalls. 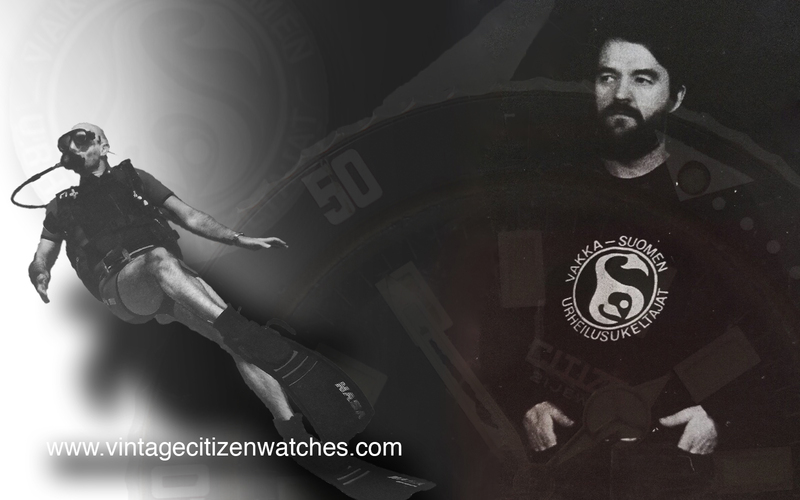 The watch made its last dive in the early ‘90s, when Seppo was tube-diving in the factory of Uusikaupunki. Well guys, if this is not a real tool diving watch, show me a better one! I almost ran out of words working on this article. There is a huge amount of pressure on me as I try to do justice to this special timepiece and its fascinating story. Seppo recalls that the movement of the watch was only serviced once, in 1975 when the bezel insert was changed because the old one was so deteriorated it was difficult to read. This could have been a safety hazard when diving so a new one was installed. Back then, the watches were not looked upon as collectable jewelry and were not pampered. 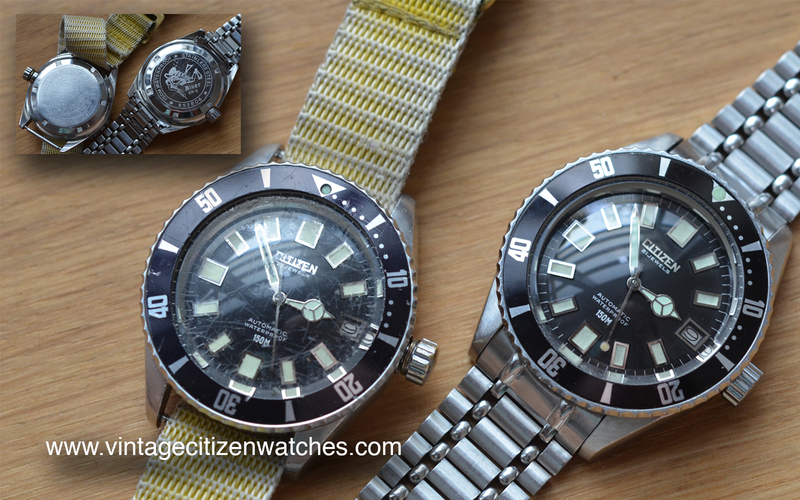 It was a diving instrument that needed to be up to the task so the original bezel was thrown away and a similar one (Citizen made, of course, but from the next 150m variant) was installed, having the exact same specifications. After this, the watch was never opened nor cleaned until the day I received it. Hundreds of dives in the cold, deep, salty sea waters, and never ever failing once. Seppo always trusted his watch to perform and the watch never disappointed him. It was always there for Seppo, keeping him safe. – what watch are you wearing now? – A “normal” Citizen. – why did you sell it? And why did you sell it to me? – I am not using it for the purpose it was meant to be used. I don’t dive anymore. I consider that you appreciate the history of the watch and the watch itself, so it felt absolutely right for you to have it. – how did it feel to let the watch go? – The watch did not have huge emotional ties, but it has been many times involved, most of all it has been a tool for me, which has worked just like a train, always flawless, just like it should. – if starting life again, would you do it the same way? Diving, watches… any regrets? – I would not change a day, everything or object leads to something and every item is correct in time, it does not change anything by switching. I could live my life 100% same way. -any advice for someone who is looking for his first watch, that is just starting his life? – I myself know that a mechanical watch is the best and safest solution for underwater use. Water and electricity do not belong together! – what is the best memory you have (when wearing the watch)? – Underwater “adventures”, the watch told me that this does not have to be left up yet. Also friends, we were a close community and we always take care of each other’s safety in diving on our trips. Great memories are those summer dives when the medusas rise abundantly in the upper layers. The sight is beautiful and it is worth experiencing at least once. -what other watches did you have at the same time with this Citizen? – Omega and Leijona, only needed one dive watch and it was this one. -how did you get this strap for the watch? Did you wear the watch with this strap when diving, or other similar ones? – It is a compass strap (Suunto, from 80 “s). Originally bought a stretch of metal bracelet, it quickly began to resound, obviously salt water did their job to it. – what would he like for me to do with the watch? Wear it? Take it diving again? Keep it in the safe with my collection? – Please keep maintaining the watch and its history, I greatly appreciate it is in the hands that know something about it and know that it’s real tool not just a cosmetic jewel. Enjoy it! Thank you Seppo! I can’t thank you enough! I am humbled to and grateful at the same time for the honor to write about you and about your watch, well… my watch, OUR watch! Somehow I feel I am a part of your adventures and hopefully the readers will appreciate it as much as I do. Thank you! Seppo’s watch and a NOS one I had in my collection that was lent to me by his present owner for this photo shoot. All things considered… This was no dream; this was the reality even though this is the dream watch we all hope to find one day. If you have a similar story to tell about your beloved Citizen watch, please let me know, or if you know someone willing to share his story, please write me, I would love to write about it. I hope you like it! Thank you Seppo and thank you Conny! Special thanks to my friend Andrei Cherascu, a famous SF author, for helping me with the article. By the way, check out his award-winning novel Mindguard and his other novels HERE. And now… it is diving time! “There is something quite rewarding in winding a watch by hand and watching it spring to life..
At a time when the world was rapidly turning it’s attention to automatics it is easy to overlook the heights that had already been achieved by their hand winding cousins.. The Chrono Master range of citizens recognises this magnificently and shows that not only does it boast some of the most accurate automatic movements of the time but also some of the best hand winding movements ever made as well. 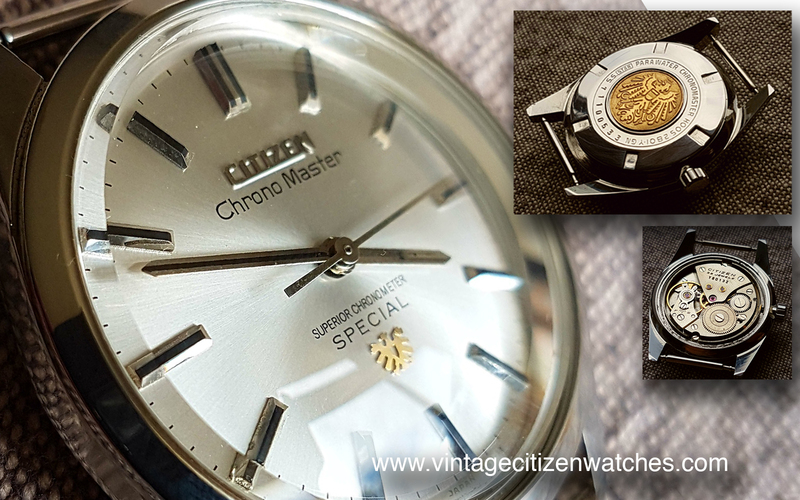 Here we have one of the finest of these the Citizen Chrono Master Superior Chronometer Special HOOS2081. Later productions were known as 4-020201. The case like all Citizen Chronometers is made in stainless steel, Polished. The lugs are excellent tapering both inwards but are also curved allowing the watch to blend beautifully into both strap and the wrist. The case back has a gold inlay medallion with an engraved eagle. The crown is well proportioned. The mineral crystal sits up proud above the bezel and the way the light passes through it creates a sight to behold from almost every angle.. 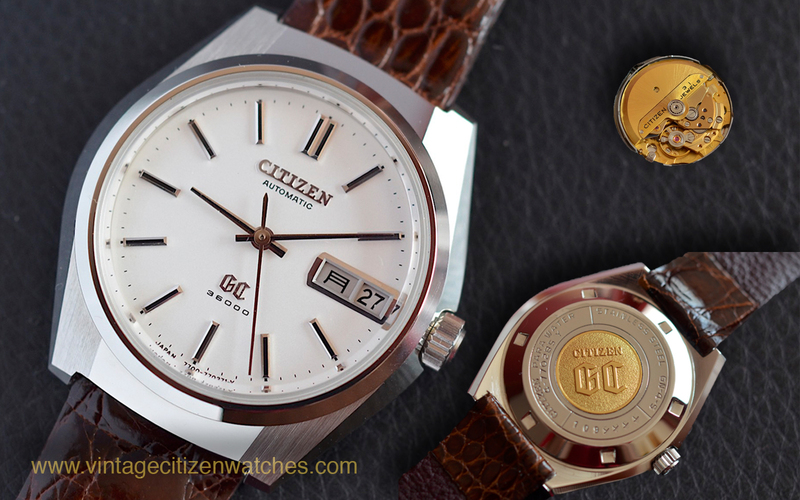 The dial is silver sunburst it has a polished Citizen logo at the top and gold eagle logo at the bottom. The dial text Superior Chronometer and Special tells us that this is no ordinary Chrono Master in fact you could say it’s a bit special.. The hour markers and hands are finished with a fine black line, It really improves the legibility of the watch as well as creating a nice contrast with the dial.. There is no date window which creates a sense simplicity and symmetry that one can’t help but feel only adds to it’s beauty.. The movement is the second iteration of the hand winding Chrono Masters the cal 0930 with 22 jewels and running at 18000 bph.. The movement is hacking which means when you pull the crown the sweep hand stops running while you set the time.. There is a fine adjuster on the balance and being a superior chronometer one would expect it capable of accuracy to rival (if not better) the cosc spesifications of the day… Each movement has a serial number and jewel count engraved upon it.. The strap sitting at 18mm between the lugs was a leather one and most likely there was a signed citizen buckle to complete the package..